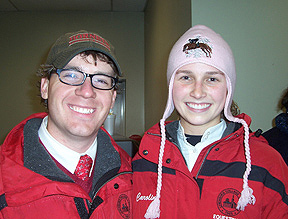 Seen here between Tournament Producer Jim Arrigon and Horse Show Manager Gwen Arrigon is Stonehill College open rider Quinn Traendly. 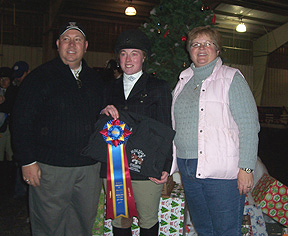 The senior from Hope Valley, Rhode Island won the prestigious Medal Division at the 2009 Holiday Tournament of Champions on December 5th, finishing ahead of 35 other riders to accomplish this feat. Long Valley, NJ - If you turn the clock back to the beginning of the decade, schools only brought one team to Tournament of Champions events. Somewhere along the way it was decided that a small number of schools could bring a second team of riders to Tournament events. To tell one team from another, schools were asked to use their school colors to avoid confusion. For example Virginia Intermont College might field a "Gold" team and a "Black" team, as these are their school colors. Then it came to pass that Tournament organizer and Xavier of Ohio Head Coach Jim Arrigon got the idea to allow schools to come up with 'funny names' instead of basing them strictly on school colors. Mount Holyoke College has had the most fun with this opportunity over the years, assigning their teams nicknames based on movie dialogue, internet sensations (team Precious and team Kiki at the '09 Holiday event), real people (team Bob for the IHSA founder in '05) and even viruses (team N1H1 and team Swine this past September at the pre-season Tourney). Centenary College last hosted the Holiday Tournament in 2007, naming their teams 'Gravy' and 'Mashed Potatoes' at the time. Hosting again in 2009 the Cyclones honored the Twilight/New Moon phenominon, naming their squads 'Team Edward' and 'Team Jacob' straight out of the latest film itself. Centenary, Mount Holyoke and Virginia Tech each fielded two teams while 22 other schools fielded one at the 18th annual Holiday Tournament of Champions in Long Valley, New Jersey on December 5th. The outcome had Arrigon (who has produced every tournament event from day one) and this writer scratching their heads as to if any program with two teams ever earned both first and second at the same invitational. One season Mount Holyoke had three teams in a pre-season event (held at the Mount Holyoke Equestrian Center) and two of them might have been in the top three. On December 5th it was Centenary College team Jacob dominating from the first class onward, with team Edward eventually the (distant) runner-up. From left to right are Lindsay Maxwell, Samantha Strouss, Head Coach Megan Taylor and Kaylee Beauchamp of the University of the South. Beauchamp (prounounced 'Beacham') was one of two Tigers to win a class on December 5th. Her first in intermediate fences was the only blue ribbon awarded to a rider not competing for Centenary during the first five classes of the day. Team Jacob scored 43 points out of a possible 56 (like at IHSA Zones and Nationals, the lowest score is not dropped at a tournament event) while Edward earned 25 for reserve including a first in open fences for defending Cacchione Cup winner Lindsay Clark. Lindsay Mohr, a junior who is ironically from the town of Long Valley, New Jersey where today's show took place, started what would be a sweep of the fences for Jacob with a win in the open fences section that started the competition. Three classes later Sami Davis won intermediate fences while Julie Connors, a junior from Hebron, Connecticut (also the hometown of Windcrest Farm, which hosts IHSA shows in multiple Zone 1 regions this season) won section A of novice fences. Candice Schober won novice flat and Emily Hawley, a senior from Fryeburg, Michigan who is a member of Centenary's Dressage Team, won walk-trot-canter to make it five blue ribbons in eight tries for Jacob. Following Clark's first to make Centenary undefeated in open fences between their two teams only Jessica Pabst brought home another blue ribbon for Edward. The freshman from Oak Ridge, New Jersey won her novice flat to give Centenary a sweep of both novice flat sections. Debbie Smith had the only other Centenary ribbon above third, coming in second late in the day for Edward in walk-trot-canter. Smith's red ribbon assured Centenary of both the Champion and Reserve team ribbons. We are not sure how it happened, but Mount Holyoke College had their most understated team names in some time. One group was known as 'Team Lyons' (the official mascot) while the other was known as 'Columbia Blue' (the shade of light blue which is a school color). Regardless of their nicknames both scored 22 points to join Lynchburg College with the third highest total of the day. 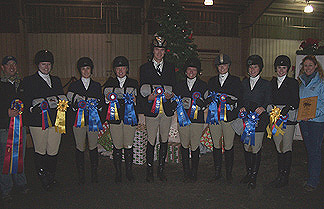 Historically Mount Holyoke College walk-trot riders have faired well at IHSA Nationals. Considering this year's Holiday Tournament had a Nationals feel about it perhaps it is not a surprise that Paulie Erni (on left) and Belinda Wenke (on right) made it a sweep for the two Mount Holyoke teams in the walk-trot division. Both 'Team Lyons' and 'Columbia Blue' scored 22 points, with the Lyons (Wenke's team) earning the yellow ribbon by way of a tie-breaker. Team Lyons scored their points in bunches. Junior open rider Lindsay Sceats was second to Lindsay Clark in open fences to start the Lyons roaring, while freshman Sally Gibb (from Princeton, New Jersey) and junior Belinda Wenke (from Woodbridge, Connecticut) won novice fences and walk-trot, respectively. Columbia Blue were lead by Paulie Erni. A freshman from Creskill, New York, Erni was also awarded a blue ribbon in walk-trot while Clara Tate was second to Connors in novice fences. Columbia Blue earned points in six of the eight attempts while Team Lyons scored points in only four. However the Tournament of Champions tie-breaker formula put the Lyons in third above Columbia Blue, either by virtue of one more blue ribbon or total points over fences. Team Lyons had the edge in both situations and thus was presented with the Yellow ribbon at the end of the day. Last season Lynchburg College finished seventh overall in the Zone 4, Region 2 team standings. Now in his second season as Head Coach, Matt Arrigon has the Hornets in third place overall and within two points of second place Bridgewater College. Lynchburg was the only team from Zone 4, Region 2 to take part in the Holiday Tournament, scoring 22 points while receiving top six placings on six occasions. Krissy Guthrie, a freshman from Glenmoore, Pennsylvania was second to Davis in intermediate fences while another freshman, Caroline Thompson, was a red ribbon winner in walk-trot-canter. From Fredericksburg, Virginia (where the University of Mary Washington will host the Winter Tournament of Champions event at Hazelwild Farm on January 30th), Thompson was sick for several weeks leading up to the Holiday Tourney (Thompson was still at the hotel resting when the show was at the halfway point). 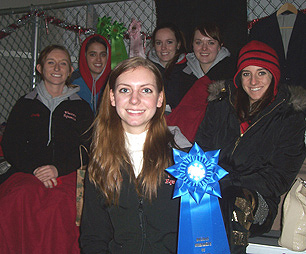 Nevertheless Thompson received a red ribbon in the final team class that was pinned during the day, moving Lynchburg into a tie with Mount Holyoke's teams. Without a blue ribbon the Hornets had to settle for the pink ribbons and some satisfaction that 20 schools were looking up at them on the scoreboard (can anyone out there clarify if Lynchburg ever competed in a 'Holiday' Tournament prior to this season? - Editor). Only six schools scored in the twenties, with Virginia Intermont College scoring exactly that number. Leading the way for VI was open rider Ashley Miller. A junior from Raritan, New Jersey (where the VI team had dinner at her home the night before), Miller was a winner in open flat while also placing fifth in open fences. Liz Mirson, a junior from Wellington, Florida was second in intermediate flat. VI was at their best sans obsticles, as 18 of their 20 points came in flat classes. Just as they have improved within their own region as the season has progressed, VI's showing in Long Valley translated into better tournament numbers than their Pre-Season appearance (19 points and eleventh place on September 27th; 20 points and sixth place on December 5th). Despite having been sick in bed for two weeks Caroline Thompson (on right) finished second in her walk-trot-canter class to elevate Lynchburg College into a tie with two Mount Holyoke teams while also receiving the pink hat she is wearing! Coach Matt Arrigon (on left) saw his Hornets score 22 points and receive fifth-place ribbons due to the tie-breakers. Zone 5, Region 1 has been a prognosticator's nightmare much of the decade, as no hunter seat team has repeated as Region Champion since the University of the South won three titles in a row 2003-05. The school known simply as "Sewanee" to many is back on top through four fall shows, leading MTSU by 12 and defending Region 1 champ Murray State by 33. The University of the South made the most of the Nationals-style environment, scoring 19 points and earning two firsts and a second while doing it. Freshman Kaylee Beauchamp won intermediate fences (along with Gibb, these were the only two riders not from Centenary to win a jumping class) while sophomore Olivia Schubert won intermeidate flat. From Alpharetta, Georgia, Schubert's first allowed the Tigers to join Centenary and Mount Holyoke as schools with a 'division sweep' on this day. Samantha Strouss, a sophomore from Ipswich, Massachusetts was second to Miller in open flat to close out the scoring for the seventh-place Tigers. Two teams scored 18 points, with Virginia Tech's 'Team Enter Sandman' receiving the eighth place ribbon. 'Enter Sandman' was the champion team at the Pre-Season Tournament, and save for their walk-trot-canter rider contained the exact same personel this time around. Early on it looked like Enter Sandman could repeat (if Team Jacob ever slumped) as Paige Messick was second to Beauchamp in intermediate fences while Anna Norwood was second to Gibb in novice fences (ironically Norwood was champion in the division and Gibb reserve champ on September 27th). However the best Enter Sandman could do after the jumps were removed was a third for walk-trot-canter rider Tracey Maier (for those with a program from the Holiday Tournament, it should be noted that Megan Ebling was sixth in novice flat and not Sherri West, the Virginia Tech Coach whose name was accidentally listed as the Enter Sandman novice flat rider). Still with 18 points to go along with 29 on September 27th the Virginia Tech Enter Sandman team has a decent shot at the 2009-10 Tournament of Champions series trophy, which will be determined after the outcome of the Winter Tournament show on January 30th. Also scoring 18 was Delaware Valley College. Currently tied for first in Zone 3, Region 2 with the University of Delaware (the latter of which also had a team entered at today's show), the Aggies earned 12 of their 18 points over two flat classes. Amanda Batista, a sophomore from Wallington, New Jersey nearly won the exact same class two seasons in a row. Batista won her walk-trot at Lake Erie College last December but earned a second this time. However her teammate from Montgomery, New Jersey faired slightly better. Kristen Lawrence, who is nicknamed 'Klawrence' by Head Coach Cory Kieschnick, was a blue ribbon winner in intermediate flat shortly thereafter. "Historically we always win a flat class," said University of Wisconsin at Madison Head Coach Mark Aplin (not pictured) before the show. Aplin was refering to the Badger's efforts at both prior Nationals and Tournament events. Though it took until the last set of team results were announced, junior Michelle Ahmann of the Badgers (holding a blue ribbon earned in walk-trot-canter while sitting in front of many teammates) proved Aplin's prediction to be correct. Rounding out the top ten was Stonehill College with 15 points. Sky Hawks senior Quinn Traendly, who was third in open fences the last time the Tournament of Champions was held at Centenary two Decembers ago, was second to Mohr in the first class of the day. Alish Wielgoszinski also earned a red ribbon for Stonehill, adding five points via a second in walk-trot. Penn State University (the State College campus, i.e., the big one) was next with 14 points. Sophomore Elizabeth Lubrano earned eight of the Nittany Lions' points with a second in open flat and a fourth in open fences. Brian Stone added four points with a third in intermediate flat. The State University of New York at New Paltz was one of four teams from Zone 2, Region 1 to compete at the Holiday tourney. Coached by Lindsay Clark's parents Gary and Susan, New Paltz scored 12 points, technically giving them 12th overall. Carolyn Smith earned the Hawks' best ribbon of the day with a third in open flat. The University of Wisconsin at Madison was next with 11 points. Before the show started, Badgers Head Coach Mark Aplin stated that "We will win a flat class, because we always do." Aplin also hinted that Wisconsin would score a point in over fences. Aplin was correct on both accounts. Junior Sarah Bernhoft put Wisconsin on the board with a sixth in novice fences. The last team classes to be placed were walk-trot-canter, and at that time junior Michelle Ahmann won the Badger's lone blue ribbon of the day. Hayley Selch, a freshman from Los Angeles, California added two points in open flat while Emily St. Aubin added a point in intermediate flat. The Badgers were a tournament rarity in that their card was not full, lacking a walk-trot rider. Two teams scored exactly ten points to round out the schools in double figures, with both from New England. Tufts University was lead by freshman Kennon Ulicny (pronounced "You-Listen-ee"), who earned a third in novice fences and a fourth in intermediate flat. The University of New Hampshire earned all ten of their points in the flat divisions, with Kate Corda earning the Wildcats' top ribbon with a third in open flat. Taylor Lautner would be proud! From left to right are Head Coach Michael Dowling, Jenn Washell, Julie Connors, Sami Davis, Colin Savaria, Lindsay Mohr, Candice Schober, Emily Hawley, Brittany Cunnane and Coach Heather Clark of Centenary College. The eight riders seen here made up "Team Jacob" and won the 2009 Holiday Tournament of Champions by a ridiculously large 18 points over another Centenary squad named "Team Edward." Three schools tied with nine points each. Lafayette College received their nine points in two chunks. Danielle Miranda was third in open flat behind Clark and Sceats while Kelsey Work was second to Schubert in intermediate flat. Work only recently pointed out of novice flat for the record. The University of Michigan could make the exact same claim as Kelly Leaman (the younger sister of Kim and former Wolverine Katie) was second in novice flat while Katie Kubacki was third in walk-trot. The University of Connecticut spread out their nine points across four classes, with Brittney Lamark's third in novice flat the Husky's highest placing. Cazenovia College, Cornell University and the University of Rhode Island each scored eight points. 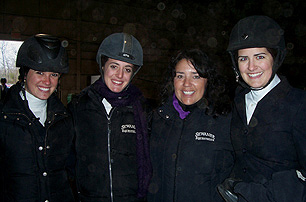 Cornell received five of their eight when freshman Emily Kowalchik was second to Schober in novice flat. Kowalchik was no stranger to the tournament organizers, having ridden for the Arrigon's Beckett Run Farm IEA team which won a National Championship her senior year in high school. Cazenovia scored their eight points over four classes, with Sarah Gray earning three of them in novice fences. Rhode Island is the final school mentioned in this story to win a team class, as Mariel Saccucci accounted for seven points in one ride. A sophomore from Wakefield, Rhode Island, Saccucci won the first class after the lunch break, which was open flat. Rounding out the rest of the scoring were Virginia Tech's other team, Hokie Nation, with seven points; the University of Delaware and Drew University, with four each; the University of Georgia with two points, Rutgers University with one and William Paterson University with nearly one. Ironically the three stewards on December 5th were the Head Coaches of Georgia, Rutgers and William Paterson! Perhaps to make it fair the Head Coaches at Centenary, Mount Holyoke and Virginia Tech should steward the Winter Tournament next month!! The Arrigons called it a "California Split. ": The walk-trot and walk-trot-canter classes were not run in the same format as the other divisions. Instead of two seperate sections of the division there were three sections of the low levels, with Judge Linda Shahinian instructed to watch all three and then select two firsts, two seconds, two thirds, etc. out of the three sections. The Arrigons referred to this as a 'California Split,' which may mean something in a card game but went over the head of this writer. However having three sections was a good idea, in that walk-trot and walk-trot-canter riders had more room to move about with fewer riders and horses in the ring. This also explains how Maier and Katie Hanley - who were on two separate Virginia Tech teams - both received points in the same section of walk-trot-canter when the program itself is set up to avoid such a situation. The Mighty Quinn: The Medal division was the final class to be placed. 36 riders rode in three separate flat classes before 18 were called back to jump following the final team class. Survivors of the flat were Nikki Ficano and Liz Rotariu of Cazenovia, Kristy Kenn of the University of Michigan, Sara Gumbiner and Terrance Prunty of Delaware Valley, Kelly Gerland of Lynchburg, Haley Flagg of Drew, Suzanne Snyder of St. Lawrence University (one of a few riders not from a school with a full team entered), Amanda Bender from S.U.N.Y. - New Paltz, Lauren Duffee of the College of the Holy Cross, Lauren Zappitelli of Wisconsin at Madison, Mohr and Kelly Arvidson of Centenary, Sceats, Miranda, Saccucci, Strouss and Quinn. Though she had the option to pin first through twelfth following the over fences rides, Judge Shahinian opted to test both Kenn and Quinn. A small number in attendance wondered if this was a test for second through third, but when all 12 placings were announced Quinn (from Hope Valley, Rhode Island) was the Champion and Kenn (a sophomore from Alpharetta, Georgia) Reserve Champion. Considering her '07 effort and her success today, Quinn might consider returning for the Medal the next time a tournament event is at Centenary, as alumni are eligible to enter the division and Quinn is certainly hard to defeat in this particular building! From left to right are Drew Head Coach Karen Sykes, Mount Holyoke Head Coach C.J. Law, Rutgers Head Coach Kelly Lamont-Francfort, Briarwood Farm Owners Jack and Katie Benson and United States Military Academy Head Coach Peter Cashman. During the awards presentation the Bensons were given the 2009-10 Pioneer Award, as Briarwood Farm has evolved into perhaps the most IHSA-friendly barn nationwide. Four different regions have held shows at Briarwood so far in 2009-10. Quinn (and the rest of the Medal riders who made the callback) did not learn where she (they) placed until after the team awards were given out and also the presentation of the Pioneer Award. The Pioneer award is not given out every season, and unlike the Lifetime Achievement award (which save for 2001 has been given out every year since 1993) the Pioneer Award may be awarded to someone who did not actually compete or hold a coaching position in the IHSA. For 2009-10 the award went to two individuals, one of which did ride in the IHSA and the other who did not. Katie Plum was the Mount Holyoke College Captain for coach C.J. Law's first season in South Hadley and her second season, when the Lyons captured their first IHSA National Championship in the spring of 1986. Plum went on to marry Jack Benson, who owned the previous incarnation of Briarwood Farm in Oldwick, New Jersey at the time. The Bensons then moved Briarwood to Readington, New Jersey during the summer of 1993, where it can be found hosting IHSA shows to this day. When Briarwood was still in Oldwick, IHSA Founder and Executive Director Bob Cacchione approached Jack Benson about his alma mater Fairleigh Dickinson hosting a show there. Benson said yes and before long other IHSA schools were hosting there as well (former Columbia and Fordham Head Coach Michael Clarke said that the Fordham program hosted an IHSA show for the first time anywhere in March of 1980 at Briarwood). 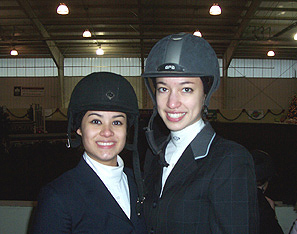 Though located in separate IHSA regions both Drew University and Rutgers University moved their team lesson programs there. When Zone 3, Region 2 split into two regions in summer of 2001 three regions were using Briarwood on a frequent basis (and why not? The Bensons make life simple for IHSA by providing a flat fee for everything except the Judge. The horses, the food consession, the portable toilets, you name it. The single fee to Briarwood covers it all - Editor). By 2006 the lure of the highly-praised Briarwood horses and the fact that roughly 250 rides per show can be accommodated was too good an offer for the schools in Central Pennsylvania to refuse. Zone 3, Region 1 became the fourth region to frequent Briarwood, often staging back-to-backs to make the most of the three hour trip. 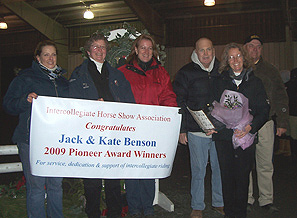 It was only fitting that Law, Drew Head Coach Karen Sykes and Rutgers Head Coach Kelly Lamont-Francfort were there to unveil the banner which read "Intercollegiate Horse Show Association Congratulates Jack and Kate Benson, 2009 Pioneer Award Winners for service, dedication and support of intercollegiate riding." Jim Arrigon presented Jack Benson with the actual Pioneer Award, which is a unique, curve-shaped glass structure. There was some concern that the Bensons might not be able to reach the Centenary Equestrian Center. Though normally perhaps a 35 minute drive, a predicted snowstorm hit Long Valley around 11:00AM, dropping nearly six inches of snow by the time the show ended at quarter to six in the evening. Originally the show was to stop at 3:00PM for the Pioneer presentation. However it came to pass that the Bensons showed up for the start of the awards presentation about quarter after five. Others on hand included East Stroudsburg University Head Coach Pat Speziale (who said the roads were bad going over the mountain) and perhaps former College of St. Elizabeth Coaches Arlene Kowalski and her daughter Karen Patrick. While such facilities as Windcrest Farm in Hebron, Connecticut (where multiple regions have competed) and Lehman Farm in Pittsford, New York (where Zone 2, Region 2 hosts at least four shows a year) have become havens for the IHSA it was Briarwood that was the first to open their arms and make life the easiest by offering the horses, the organization (many of the Briarwood 'Schoolers' have gone on to compete in the IHSA) and the accessibility that at one time was the exception rather than the rule if a program (sans an on-campus facility) wanted to host an IHSA show. A Learning Experience: Though this writer takes photos at nearly every IHSA show he attends, he had never attempted to record what some would call 'Video' at such a show. With a second, brand-new camera on hand, segments running between 90 seconds and three minutes were recorded. Included were interviews with some of the winners (Miller, Gibb, Lawrence, Pabst), a coach and rider (Kowalchik with Cornell Head Coach Chris Mitchell), a pair of Cazenovia riders who discuss their early-season success in Zone 2, Region 2 and a two-part interview with the Bensons (which would have been one segment had the batteries not needed to be replaced midway through the discussion). These recorded segments will NOT appear on Campus Equestrian but will instead be found on the campusequestrian.com Facebook page. The interview with Cazenovia's Kristen Williams and Paige Brady was uploaded on December 8th but because it took nearly three hours for three minutes to upload look for a new segment on our facebook page each day for a few days. What's next? : Save for the University of Michigan, which will likely host shows in early January, several of today's teams will next compete as entries in the Winter Tournament of Champions at Hazelwild Farm in Fredericksburg, Virginia on January 30th. In order to have a shot at the Tournament Series Trophy a team must have competed at both the Holiday Tournament and one of the other two Tournament events. With so few teams at Centenary having already shown at Randolph College on September 27th, the impetus to compete in a second tournament and have a shot at the trophy comes down to this final contest, to be hosted by the University of Mary Washington. Provided Centenary enters that one, it will be hard to keep the Trophy from setting up shop in Long Valley. If the Cyclones do not compete on the final Saturday in January then the door is open for Virginia Tech, Mount Holyoke, Lynchburg and others to make a run for it. Show Incidentals: Cloudy skies to start, followed by heavy snow with accumulations up to six inches. Temperatures in the upper 30's. Entire show held indoors. Start time: 9:05AM. Finish: 5:49PM. Judge: Linda Shahinian. Stewards: Ginny Smith/University of Georgia; Hayley Rooney, William Paterson University and Kelly Francfort/Rutgers University. This show was Hunter Seat or English only. Team Totals: Centenary College - Team Jacob (High Point Team) 43; Centenary College - Team Edward (Reserve) 25; Mount Holyoke College - Team Lyons 22; Mount Holyoke College - Columbia Blue 22; Lynchburg College 22; Virginia Intermont College 20; University of the South 19; Virginia Tech - Enter Sandman 18; Delaware Valley College 18; Stonehill College 15; Penn State University (State College) 14; State University of New York at New Paltz 12; University of Wisconsin 11; Tufts University 10; University of New Hampshire 10; Lafayette College 9; University of Connecticut 9; University of Michigan 9; Cazenovia College 8; Cornell University 8; University of Rhode Island 8; Virginia Tech - Hokie Nation 7; University of Delaware 4; Drew University 4; University of Georgia 2; Rutgers University 1 and William Paterson University 0. Open equitation over fences - Section A: 1. Lindsay Mohr, Centenary College - Team Jacob. 2. Quinn Traendly, Stonehill College. 3. Kelly Gerland, Lynchburg College. 4. Elizabeth Lubrano, Penn State University (State College). 5. Devan McNamara, Delaware Valley College. 6. Lauren Ryalls, Virginia Tech - Team Hokie Nation. 7. Kristen Williams, Cazenovia College. 8. Kim Lynch, University of New Hampshire. Open equitation over fences - Section B: 1. Lindsay Clark, Centenary College - Team Edward. 2. Lindsay Sceats, Mount Holyoke College - Team Lyons. 3. Danielle Miranda, Lafayette College. 4. Brett Flower, Virginia Tech - Team Enter Sandman. 5. Ashley Miller, Virginia Intermont College. 6. Marilyn Bennett, University of Connecticut. 7. Kristy Kenn, University of Michigan. 8. Lindsay Maxwell, University of the South. Intermediate equitation over fences - Section A: 1. Kaylee Beauchamp, University of the South. 2. Paige Messick, Virginia Tech - Team Enter Sandman. 3. Jessica Buck, Delaware Valley College. 4. Courtney O'Connell, Mount Holyoke College - Columbia Blue. 5. Rachel Foster, Stonehill College. 6. Libby Fedorko, University of Connecticut. 7. Bridget Conner, University of Georgia. 8. Stephanie Zawatski, Penn State University (State College). Intermediate equitation over fences - Section B: 1. Sami Davis, Centenary College - Team Jacob. 2. Krissy Guthrie, Lynchburg College. 3. Stephanie Scoleri, University of Delaware. 4. Allison O'Neill, Mount Holyoke College - Team Lyons. 5. Kristen Wavell, Virginia Tech - Team Hokie Nation. 6. Heather Chmura, University of Rhode Island. 7. Emilee Raynor, State University of New York at New Paltz. 8. Emily Hulak, Rutgers University. Novice equitation over fences - Section A: 1. Julie Connors, Centenary College - Team Jacob. 2. Clara Tate, Mount Holyoke College - Columbia Blue. 3. Kennon Ulicny, Tufts University. 4. Rachel Jones, Lynchburg College. 5. Rebecca Rossi, Stonehill College. 6. Ashley Perry, Virginia Tech - Team Hokie Nation. 7. Erika Flaschner, Penn State University (State College). 8. Jenna Calcaterra, William Paterson University. Novice equitation over fences - Section B: 1. Sally Gibb, Mount Holyoke College - Team Lyons. 2. Anna Norwood, Virginia Tech - Team Enter Sandman. 3. Ali Krecker, Centenary College - Team Edward. 4. Sarah Gray, Cazenovia College. 5. Kathryn Colavito, State University of New York at New Paltz. 6. Sarah Bernhoft, University of Wisconsin. 7. Kelly Leaman, University of Michigan. 8. Mary Jane Steward, University of Georgia. Open equitation on the flat - Section A: 1. Mariel Saccucci, University of Rhode Island. 2. Elizabeth Lubrano, Penn State University (State College). 3. Carolyn Smith, State University of New York at New Paltz. 4. Katie Kramer, Drew University. 5. Zoe Samuel, Cornell University. 6. Paige Brady, Cazenovia College. 7. Elizabeth Tripp, Mount Holyoke College - Team Lyons. 8. Kelly Arvidson, Centenary College - Team Edward. Novice equitation on the flat - Section A: 1. Jessica Pabst, Centenary College - Team Edward. 2. Kelly Leaman, University of Michigan. 3. Brittany Lamark, University of Connecticut. 4. Sam Marsh, State University of New York at New Paltz. 5. Carolyn Daly, Mount Holyoke College - Columbia Blue. 6. Tess Mahoney, Fairfield University. 7. Audrey Cooney, University of the South. 8. Rachel Cohen, University of Rhode Island. Open equitation on the flat - Section B: 1. Ashley Miller, Virginia Intermont College. 2. Samantha Strouss, University of the South. 3. Kate Corda, University of New Hampshire. 4. Brittany Johnson, University of Connecticut. 5. Hayley Selch, University of Wisconsin. 6. Meredith Feinberg, Mount Holyoke College - Columbia Blue. 7. Brett Flower, Virginia Tech - Team Enter Sandman. 8. Megan Spilatro, University of Delaware. Novice Equitation on the flat - Section B: 1. Candice Schober, Centenary College - Team Jacob. 2. Emily Kowalchik, Cornell University. 3. Chelsea Dressler, Virginia Intermont College. 4. Kate Frazier, University of New Hampshire. 5. Emily Eckenberger, Lynchburg College. 6. Megan Ebling, Virginia Tech - Team Enter Sandman. 7. Courtney Bruso, Cazenovia College. 8. Mary Jane Steward, University of Georgia. Walk-trot equitation on the flat - Section A: 1. Belinda Wenke, Mount Holyoke College - Team Lyons. 2. Alish Wielgoszinski, Stonehill College. 3. Katie Kubacki, University of Michigan. 4. Lacey Lohr, State University of New York at New Paltz. 5. Beth Jonas, Centenary College - Team Edward. 6. Kim Escobar, Virginia Tech - Team Enter Sandman. 7. Zoe Lillis, University of Rhode Island. 8. Drew Nichols, Lynchburg College. Walk-trot equitation on the flat - Section B: 1. Paulie Erni, Mount Holyoke College - Columbia Blue. 2. Amanda Batista, Delaware Valley College. 3. Jenn Washell, Centenary College - Team Jacob. 4. David Eder, Tufts University. 5. Rebecca Kaszmarek, Virginia Intermont College. 6. Stacey Ceron, Drew University. 7. Michelle Yip, William Paterson University. 8. Phil Trombley, University of New Hampshire. Intermediate equitation on the flat - Section A: 1. Kristen Lawrence, Delaware Valley College. 2. Liz Mirson, Virginia Intermont College. 3. Brittany Cunnane, Centenary College - Team Jacob. 4. Taylor Fellows, Lynchburg College. 5. Kristin Small, Cazenovia College. 6. Emily Hulak, Rutgers University. 7. Dana Carey, William Paterson University. 8. Margaret Swanson, Mount Holyoke College - Team Lyons. Intermediate equitation on the flat - Section B: 1. Olivia Schubert - University of the South. 2. Kelsey Work, Lafayette College. 3. Brian Stone, Penn State University (State College). 4. Kennon Ulicny, Tufts University. 5. Bridget Conner, University of Georgia. 6. Emily St. Aubin, University of Wisconsin at Madison. 7. Paige Messick, Virginia Tech - Team Enter Sandman. 8. Ellen Rauchbach, Centenary College - Team Edward. Walk-trot-canter equitation on the flat - Section A: 1. Michelle Ahmann, University of Wisconsin at Madison. 2. Debbie Smith, Centenary College - Team Edward. 3. Tracey Maier, Virginia Tech - Team Enter Sandman. 4. Katie Hanley, Virginia Tech - Team Hokie Nation. 5. Haleigh Boswell, Penn State University (State College. 6. Elizabeth Briggs, Cornell University. 7. Rebecca Graffy, Tufts University. 8. Gracie Becker, University of the South. Walk-trot-canter equitation on the flat - Section B: 1. Emily Hawley, Centenary College - Team Jacob. 2. Caroline Thompson, Lynchburg College. 3. Anne Tucker, Mount Holyoke College - Columbia Blue. 4. Valerie Goeman, University of New Hampshire. 5. Brittany Callahan, Cazenovia College. 6. Samantha Ricci, Stonehill College. 7. Alyssa Shafer, University of Delaware. 8. Cleo Stern, State University of New York at New Paltz. Medal Division: 1. Quinn Traendley, Stonehill College. 2. Kristy Kenn, University of Michigan. 3. Liz Rotariu, Cazenovia College. 4. Lindsay Mohr, Centenary College. 5. Suzanne Snyder, St. Lawrence University. 6. Kelly Gerland, Lynchburg College. 7. Lauren Duffee, College of the Holy Cross. 8. Danielle Miranda, Lafayette College. 9. Mariel Saccucci, University of Rhode Island. 10. Lauren Zappitelli, University of Wisconsin at Madison. 11. Kelly Arvidson, Centenary College. 12. Nikki Ficano, Cazenovia College.